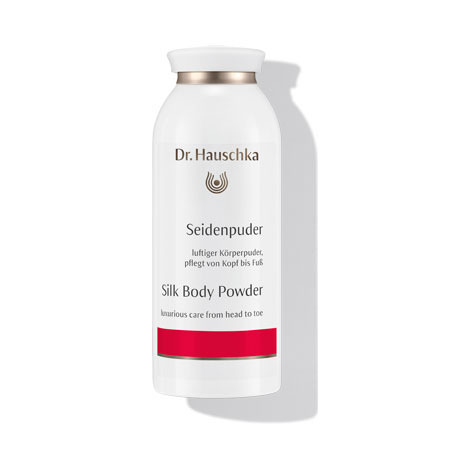 A silky-smooth absorbent powder with a soft, fresh scent that stabilises the skin’s natural balance. This body powder provides nurturing and luxurious all-day care for all skin conditions. The fine powder composition is free from skinirritating substances. Your body receives a natural matte sheen and highly sensitive skin is gently protected. Gentian and oak extracts cool and refresh while sage extract supports healthy skin and scalp. Apply to clean, dry skin after showering or bathing. Oryza Sativa (Rice) Starch, Silk (Serica) Powder, Silica, Fragrance (Parfum)*, Linalool*, Limonene*, Geraniol*, Coumarin*, Citronellol*, Citral*, Gentiana Lutea Root Extract, Quercus Robur Bark Extract, Salvia Officinalis (Sage) Leaf Extract, Diatomaceous Earth (Solum Diatomeae). Suitable for use as a body powder, a gentle deodorant, a face powder and for baby care.